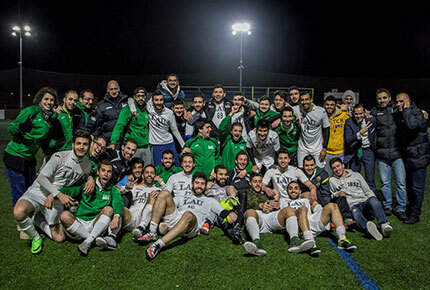 LAU Captains men’s football varsity team reign at Uni Championships. Next month, the LAU Captains are going to Greece for the international university league championships. “Where there’s a will, there’s a way, and now after years of hard work, the Captains have taken the gold,” enthused LAU Byblos Athletics Director Joe Moujaes following the final varsity football match of the University Championships, which ended in a 1-0 victory for the LAU Captains, their first championship victory in the history of the Byblos campus. “Men’s football was always a challenge, as our students are not of a football culture, but after trying various strategies, we’re delighted with the win,” added Moujaes. Bank manager by day and Captains football coach by night, Alaa Diab took over responsibility for the varsity team at the beginning of this season. “Football is a team sport and so this win is a team achievement,” he said , expressing his gratitude for the support of the administration, the players, the coaching assistants and the team physiotherapist. Among the 30 players in the varsity team, four play for teams in Lebanon’s premium league. They are an asset to the team, admitted Diab, before stressing that discipline and camaraderie are just as important, if not more so, than skill. “I told all the players at the beginning of the season that our goal was first and foremost to build a strong team.” That meant players were obliged to attend most of the training sessions, regardless of their experience, if they were to stay on the team.